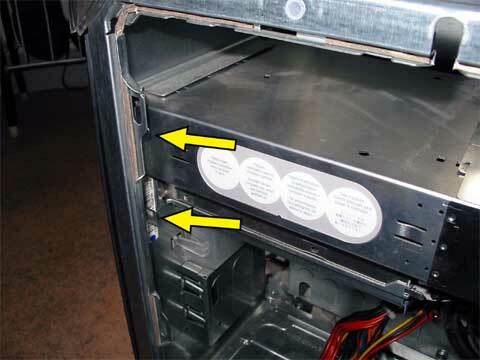 Installing a SuperDrive in a G4 Mirorred Door. This is a entry level G4 MDD ,867 bi proc. 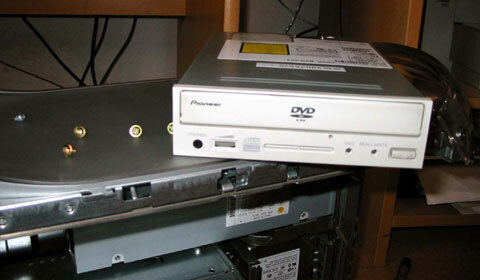 This machine comes with a basic combo drive (DVD/CD-RW)... a little bit slow... 16X. 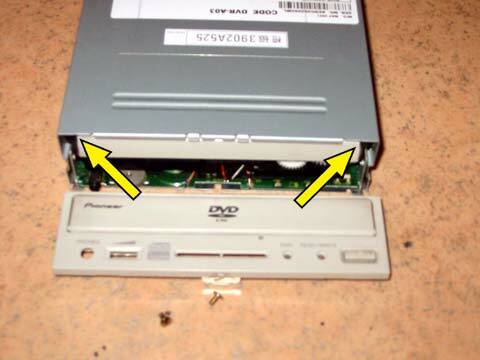 As I want to mount my own movies through iDVD, I decide to install a DVD burner: a A03 Pioneer (reads CDs at 20X, burns them at 8X and burns DVDs at 2X). First, extract the old combo. 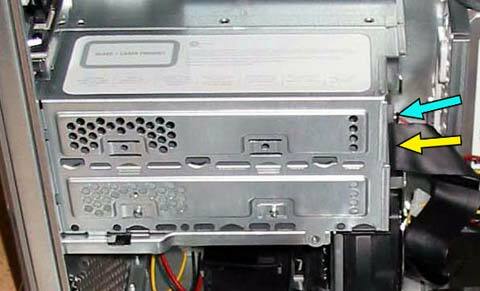 Diassemble the G4 front face: removes the two clamps. 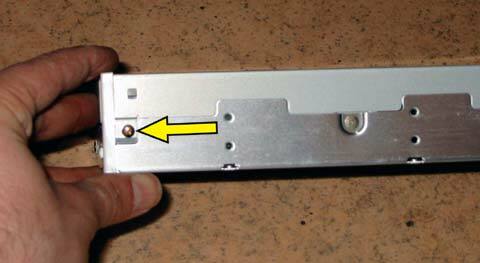 Removes the two screws in the front face of the burner and extract it. 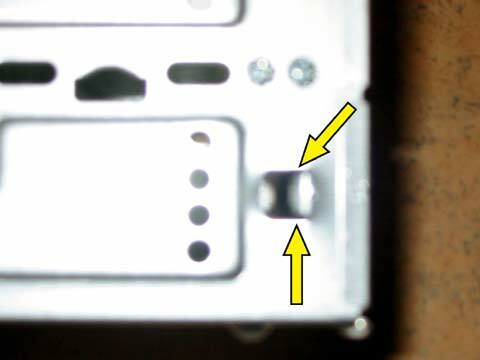 On the MDD, we open the cover and unscrew the two screws which fix the two 5'' bays. 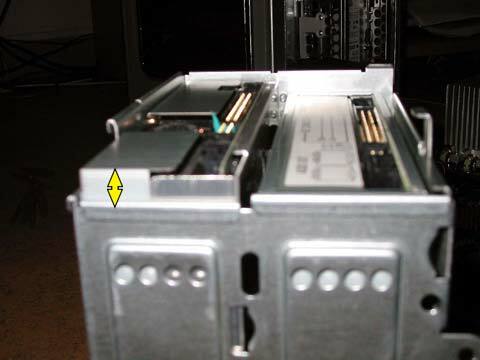 We slide the rear cache to the front and we disconnect the IDE cable (yellow aarow) and the power cable (blue arrow). 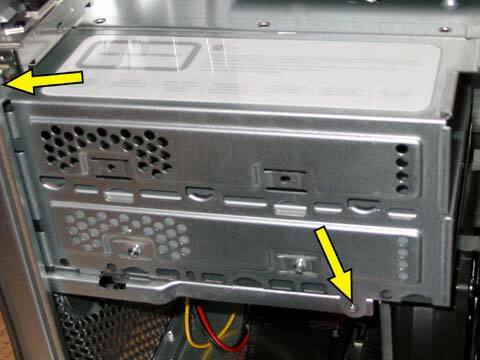 The combo will be placed under, in the bay: for compatibility reasons, non-Apple superdrive have difficulties to mount if they are not set to masters under OSX 10.2.3. And the combo will set up to slave. 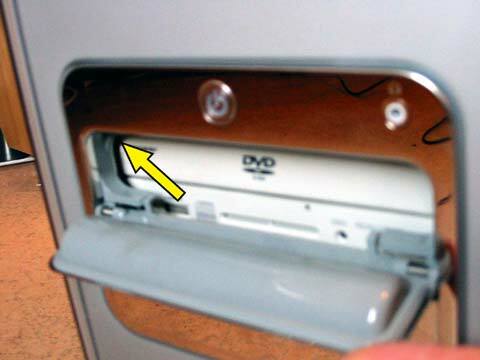 The DVD burner is dragged into the machine from the front face of the bay... but we directly discover that one of the craddle's paw creates problems. Smoothly, we curved it to the exterior of the machine. This burner is longer than the normal ones: its front cache prevents the burner to be correctly placed into the machine. ... and the burner can be put in the craddle. Unfortunately, as the burner is long, we cannot put back the rear protection of the bay! 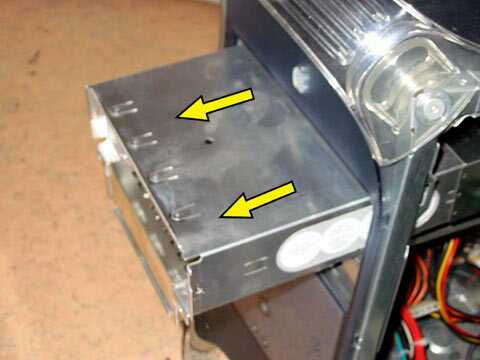 We have also to smoothly file the burner's tray edges to help it to open with any damage. Guy Keymolen gives a more elegant solution: removing the front face. Tray opened, slide the front face to the top. 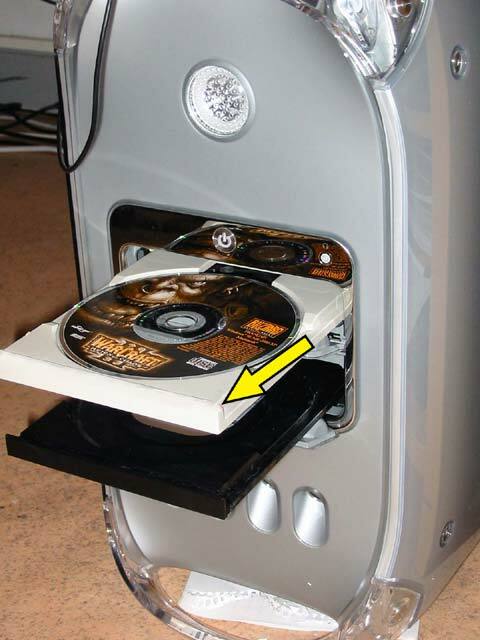 In this case, the CD reader is no longer hermetically closed -> noiser and more risko f unwanted CDs ejection! 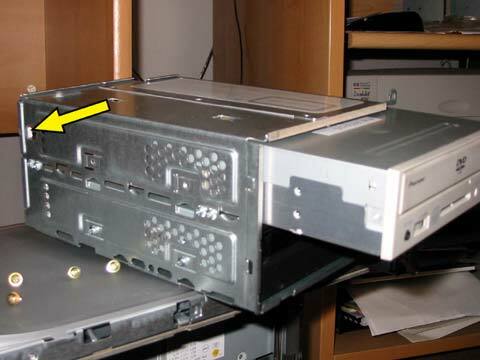 -> the ideal solution is to retrieve from a defect drive the front face and file its edges. The new fresh face can therefore be kept for resell it or for using it in a external box.